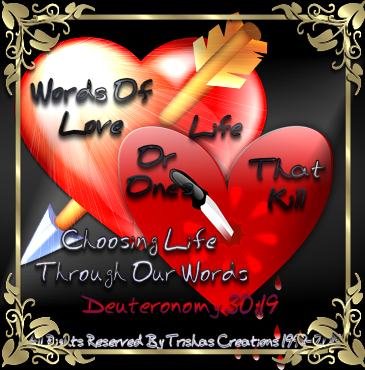 "Choosing Life Through Our Words"
Welcome to "Choosing Life Through Our Words"
In Deuteronomy, the Lord told His people that He had set before them life and death and urged them to choose life. In Proverbs 18:21, also says: we can choose life or death. "Death and life are in the power of the tongue, and they who indulge in it shall eat the fruit of it (for death or life"). Could it be, that when people are filled with hate and jealousy, resentments, and they speak it out of their mouths and they are thinking how much they can't stand this person or hate that person, or they are faking their illness, or maybe judging other's or wishing someone would die, that , this is the reason they are living by their words that they speak? Yes, by the way Deuteronomy and Proverbs says," those shall eat the fruit of it" words can kill and the thoughts of those wrongful words we do live by, so if you want to change your way of thinking and not let your thoughts become wrongful words, you can change your way of thinking right now. No one is exempt from thousands of thoughts going through our minds each day, we must renew our minds after the Spirit and not of the flesh. Our worldly minds (carnal) have to much practice on operating freely, when we think wrong thoughts and it comes with no effort. But, we have to make ourselves purposely choose to think the right thoughts. When bad thoughts come and they bombard my mind, I used to shake my head, back and forth and sometimes those bad thoughts would go away, you should try it sometimes. We have to finally decide to be like minded with God, then we will need to choose and continue to choose the rightful thoughts. Do NOT let satan tempt you into to saying hurtful things can possibly really kill someone, or their spiritual being, their soul, their heart. Because , if you do and something happens to that person, you will never have been able to tell them you was sorry, and make it right with them, and then it may just be to late for you. We have a battle in our minds , but we can force our minds not to think bad things. We have to tell ourselves and our minds we are not going in that direction of negativity or thinking bad and hateful and mean thoughts. We get bombarded with so many thoughts, of depression, anger, jealousy, hate, envy, fears, loneliness, etc. and we have to change our thinking because what we thinks, comes out of our mouths and words can kill one's spirit. Ask God, to help you , ask God to change your way of thinking and remind yourself you are God's and He loves you, and He will help you. He is not going to leave you nor is He going to forsake you, and leave you hanging on a string. He is there for us and He wants us to succeed , not be in fear and loose life. Ask Him today to help your thoughts and change your way of thinking. Because remember our words can cause death or they can cause life!